Kannika reaching for her lunch with her mahout. There are so many reasons why we chose to visit Thailand this year. Besides the fact that Thailand has been one of the top places in our list to visit, one of the main reasons was the recent airfare price drop in flights to Bangkok, and the other, like I mentioned in our previous post, was the convenience of having easy access to delicious vegan food (a huge plus for any vegan traveler). However, both of these reasons almost pale in comparison to another, more unique, experience that is inherently, authentically Thai. Madee, which means "new beginnings" in Thai. 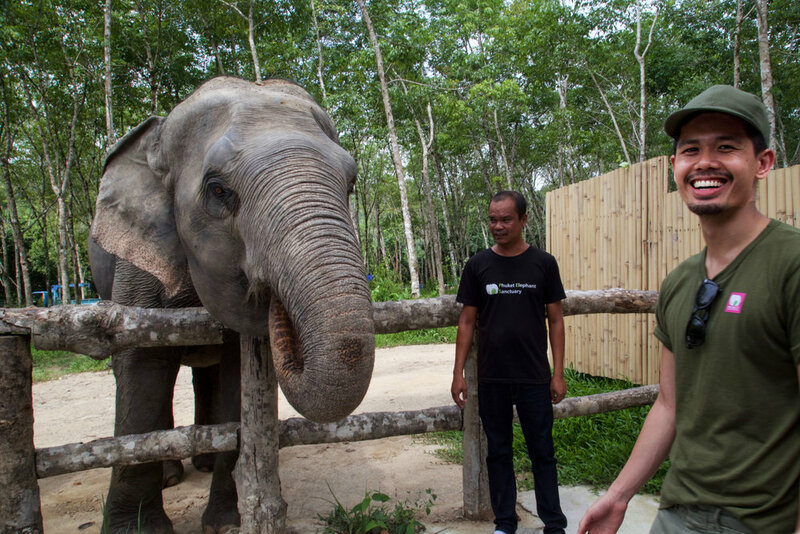 Visiting an elephant sanctuary while in Thailand is something that we both highly recommend doing. It is an experience unlike any other. Learning about each individual elephant's names and hearing about the stories leading up to their rescues, as well as how elephants are used and treated in today's entertainment/tourism and logging industries, is something that any tourist visiting Thailand needs to hear. The sanctuary that we visited, Phuket Elephant Sanctuary, is one of the first elephant sanctuaries in the island of Phuket, and the first to truly champion ethical tourism. 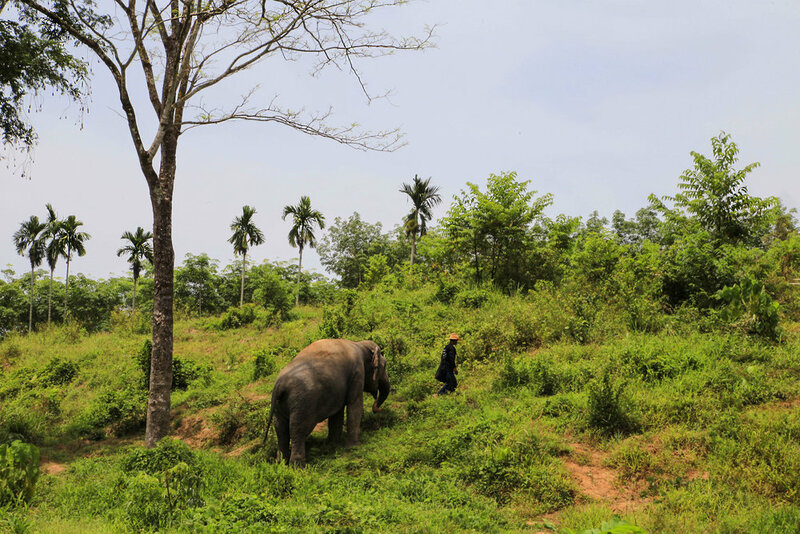 With the support of Lek Chailert, founder of Save Elephant Foundation and the highly successful Elephant Nature Park in Chiang Mai, Phuket Elephant Sanctuary (or PES) broke ground in May 2016 and opened later that same year in November. We could not have been happier that this pioneering elephant sanctuary opened in Phuket, especially since the island is one of the most visited places in Asia by tourists. When we were first doing our research on which elephant sanctuary to visit, we came across several elephant sanctuaries online. It didn't take us long, however, to realize that many of these so-called sanctuaries are nothing but another place where elephants are treated and seen as commodities, masquerading as ethical sanctuaries. We've read stories of these places where the elephants were actually chained and kept in cages with little to no food, some swaying back and forth (a clear sign of psychosis due to being kept in confined spaces), and even a place where the mahout (an elephant's keeper) actually yells commands to the elephant to perform circus-like tricks for the visitors (i.e. kissing a visitor on the cheek on command). 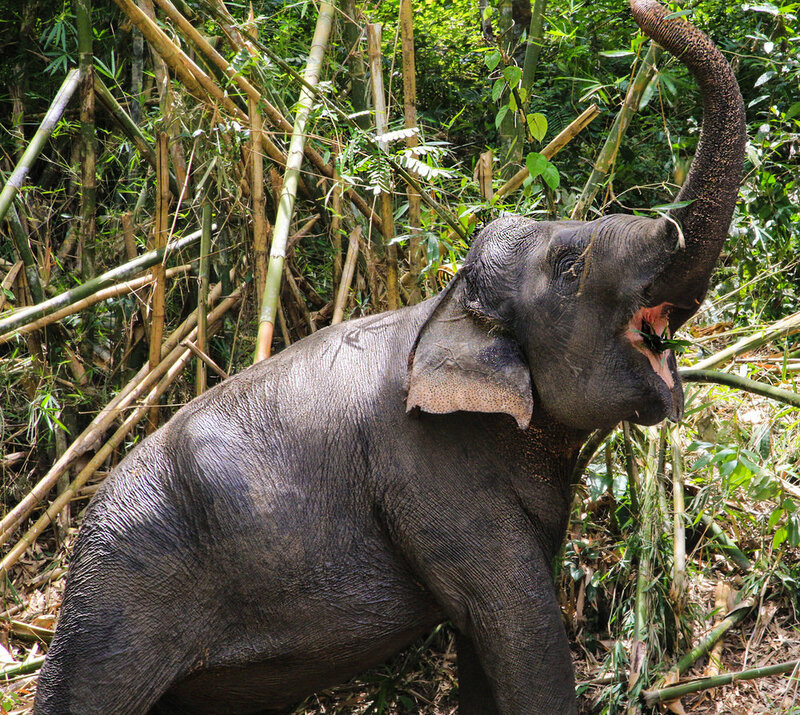 Kannika, the "life and soul" of the sanctuary, having a mid-afternoon snack of greens and bamboo. Fortunately for us, our experience was nothing like this. 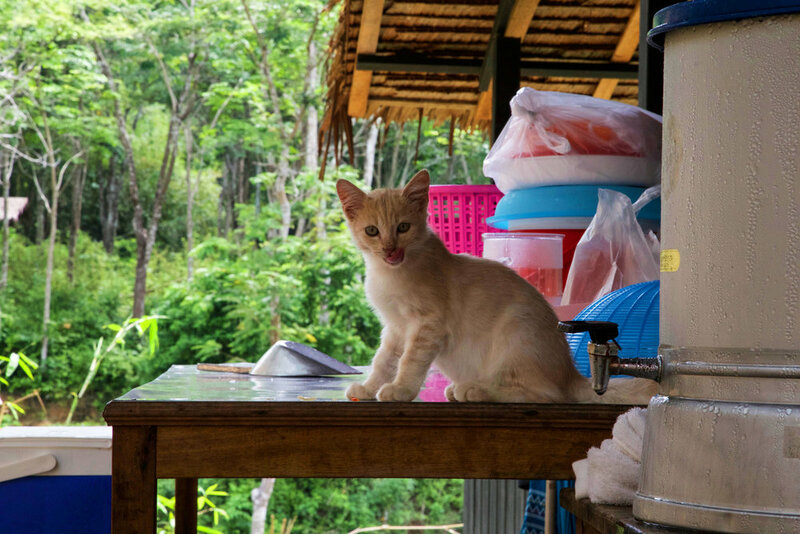 Since the sanctuary is located quite literally in the jungle, we had to meet a separate driver who took us from the meeting point to the sanctuary, about 10 minutes away. The drive to the sanctuary was nothing short of amazing. Seemingly endless rows of lush trees straddled our truck on either side, providing shade and made for a very scenic ride. Once the driver pulled into a clearing, we got off the car and made our way to the sanctuary's reception/observation deck, which overlooked much of the sanctuary grounds. While the sanctuary is still fairly new, it definitely fit in with the natural environment with minimal disruption to the surrounding jungle. We absolutely loved that the people in charge of this project made a clear and genuine effort to place these rescued elephants, who spent most of their lives tirelessly working for humans, in an area that closely resembles their natural habitats and that allowed them to roam and do what elephants do in peace. After everybody got settled, they showed us a very cute but very informative safety video on how to properly interact with the elephants, especially since some of them still carry the trauma of being abused under human hands. With the rise of demand for elephant riding, trekking, elephant shows, and even as ridiculous sounding as paintings drawn by elephants, more and more elephants are snatched from the wild while they are just calves (which often entails killing other herd members, including the calf's mother, who try to protect the young elephants) and broken in at a young age in order to fulfill these demands. Through a cruel "breaking in" process locally known as pajan, these captured calves are "isolated and then forced into a pen and tied with ropes to prevent them [from] moving. They are deprived of water, food and sleep. Terrified, they are brutally, often fatally, beaten with rods, chains or bull hooks (a rod with sharp metal hooks at the striking end) and stabbed with knives and nails." This practice is designed to break their spirits and brutalize them into submission, not unlike tamed horses. The beatings are often so ruthless that "50% [of young elephants] or more die during this ‘domestication’ process." While this is distressing to see, please note that this is common practice in Thailand. While there are no laws (that we know of) that protect these animals from this barbaric process, tourists can help to end this by not supporting and refusing to see cruel acts like animal shows and elephant riding. Instead, we encourage you to visit an ethical sanctuary that helps rehabilitate these majestic creatures and help these animals live out their days with dignity. It truly is the least we can do. Gaew Ta, the blind elephant, eating a basket of pineapple. Much like in the wild, each of the elephants in the sanctuary has their own distinct personality and story, all of which are available to read on the sanctuary's website. We first met Gaew Ta, who is blind, and was still, understandably, very wary of strangers. According to our tour guide, she lost her sight from people repeatedly shooting rocks and other small items at her eyes with a sling shot. To this day, she still carries scars and circular wounds on her bottom, which upon closer inspection, were in fact, cigarette burns. Although it was tremendously heartbreaking to hear her story, it was comforting to know that she is now at a place where no human will ever abuse her again. After Gaew Ta, we then got to feed Madee and Kannika, who are best friends and are practically inseparable. The two are seen almost always next to each other ever since they were rescued together. 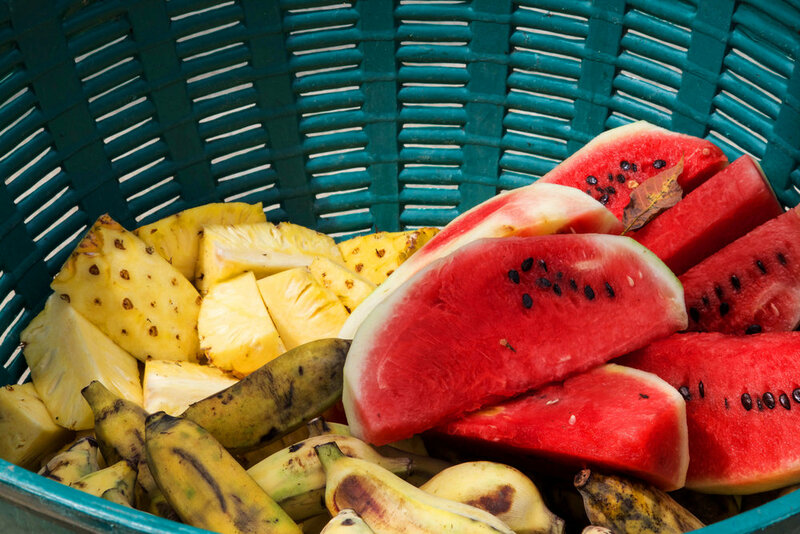 The sanctuary provided us baskets of fruits to feed the elephants, most of which were gone after a couple minutes. (These elephants can eat!) Throughout the tour, it was amazing to see the clear bond between these two elephants and just shows how, they, too, can form emotional and complex social relationships much like us humans do. Finally, we met Dok Gaew, the oldest elephant in the sanctuary. What she lacks in speed, she more than makes up for her size (she is the tallest elephant in the sanctuary). She spent most of her life in the logging industry, pulling tree trunks from the depths of the jungle. As she got older, a saddle was placed on her back and she was forced to give rides to unsuspecting tourists. Most people don't see the harm in elephant riding but the fact of the matter is, an elephant's body, much like that of a horse, is not meant to carry that amount of weight for several hours a day on a daily basis. Today, she is usually seen walking steadily behind, trying to catch up with her friends Kannika and Madee. Meeting the people behind this project and talking to the tour guides, who clearly love what they do, is also very gratifying. These people truly care and respect these animals and want to make their lives as comfortable as they can. Louise Rogerson, the Project Director, who we had the pleasure to talk to, was an inspiration. Having seen the cruelty that goes into elephant tourism, she left her job in fashion to pursue and campaign for ethical elephant tourism in Southeast Asia. Together with Lek and Montri Todtane, the founder and CEO of Phuket Elephant Sanctuary, they set out to build a place that provides care and rehabilitation for abused elephants so that they could live out the rest of their lives in peace. Dusty and I meeting Louise Rogerson, Project Director of Phuket Elephant Sanctuary. If you want to visit the sanctuary, we highly recommend booking at least one month in advance as the place gets booked pretty quickly. For more info and bookings, check out their website here. Have you been to an elephant sanctuary too? Let us know what your experience was like and tell us of any sanctuaries we should be visiting in the comments section below!